'Marvels And Monsters' Unveils Asians In Comics An NYU-based art exhibit is looking at the evolution of Asian characters in U.S. comic books. Many such characters began as forms of xenophobic propaganda, and some are reflecting current U.S. perceptions of Asians. To learn more, guest host Allison Keyes speaks with William F. Wu, who collected the artwork on display, and Jeff Yang, who's curating the exhibit. An NYU-based art exhibit is looking at the evolution of Asian characters in U.S. comic books. Many such characters began as forms of xenophobic propaganda, and some are reflecting current U.S. perceptions of Asians. To learn more, guest host Allison Keyes speaks with William F. Wu, who collected the artwork on display, and Jeff Yang, who's curating the exhibit. ALLISON KEYES, host: This is TELL ME MORE, from NPR News. I'm Allison Keyes. Michel Martin is away. We end today's program with ink. We're flipping through the pages of comic books. In a moment, we speak with one of the creators of the new biracial Spiderman. He's half African-American and half Latino. That's in a few minutes. But first, we take a look at an exhibition that chronicles four decades of Asian images in American comic books, some extremely stereotypical. Consider the nefarious Yellow Claw from a 1956 Marvel comic book, who looked like an evil vampire of sorts with garish, yellow skin, long, claw-like fingernails and exaggerated, almost animal-like features. The exhibit called "Marvels and Monsters: Unmasking Asian Images in U.S. Comics," looks at how images of Asians that began as xenophobic propaganda have evolved and how such characters still define some American perceptions of Asians today. It's on display at the New York University library through August 19th. Joining us now to talk about it are science fiction writer William F. Wu, whose collection of comics is featured in the exhibit. We also have with us exhibit curator Jeff Yang. He's one of the editors of the book, "Secret Identities: The Asian American Superhero Anthology." His column, "Asian Pop," appears in the San Francisco Chronicle. Welcome to the program, gentlemen. WILLIAM F. WU: Thank you. KEYES: Mr. Wu, talk to us a bit about your collection and how you started thinking about the way Asians were characterized in the books. WU: I had always loved comic books. You know, I started reading them when I was little. And as I got older and more interested in popular culture representations of Asian-Americans, I found I already had a lot of them in my comics. And I started separating out the comics that had Asian characters. KEYES: When did you start thinking, hmm, the people on those pages don't look like anyone I know? WU: I suppose it was subliminal, you know, from the very beginning. I was thinking just before we started that I had noticed an old - a Lone Ranger comic book in which the Lone Ranger was a hero who had black hair. He was one of the few, along with Superman. And this showed up in a play called "Chickencoop Chinaman" by Frank Chin, where the main character fantasizes that the Lone Ranger is really Asian and he wears the mask to hide his Asian eyes. WU: And I think I was having this kind of reaction as I was growing up. But it was really not until my 20s that I began thinking about these things in a systematic way. KEYES: Jeff, I want to ask you the same question. You're a comic book fan, as well. What was your first favorite character? YANG: It's funny, because I think that for me, it wasn't a single character so much as kind of the larger idea of comic book superheroes, the idea that superheroes represented individuals who were extraordinary but had to hide that extraordinary aspect of themselves, had to sort of, you know, put on masks to protect the things that made them different, both for good and for evil. And that notion that somehow - especially those for whom their powers also made them kind of outcasts, outsiders, was something that I think was appealing - not just to myself as an Asian-American comic book fan, but to comic book fans across the board, and I think especially comic book fans of color. It's part of the reason why I think you're seeing that generation of fans growing up into creators, and now I think increasingly taking dominant roles in the industry. KEYES: Jeff, the exhibition kind of looks at the way comic books and current events mesh together. Over time, how has American history influenced the way Asians are depicted? YANG: One of the things that we realized as we looked at this collection - and the collection is extraordinary. He has collected literally hundreds, thousands of comic books across a span that, in many ways, defines the forge of Asian America, in a way, you know, 1941 all the way through 1986, a period of time in which America was engaged in physical wars and sort of spiritual ones with Asian countries - you know, from World War II, the war in the Pacific, through the Korean War, Vietnam War, and then the economic and political battles with Japan and China that followed. And so comic books, in a lot of ways, pick up a lot of this resonant energy around how Americans were thinking of Asians in ways that virtually no other medium does. You see this character, like the character of the Yellow Claw emerging, this sort of monstrous, incredibly alien, exotic figure, this puppet master behind the scenes emerging just as America's anxiety around Chinese immigration, around the changing demographics of the country was first beginning to be felt. WU: This is Bill. I'd like to mention that Yellow Claw was also an imitation Fu Manchu, kind of a joining, I think, of the older stereotypes, the danger of the yellow peril envisioned - the way it was envisioned in the 19th century coming into the 20th, and then of course merging with the elements that Jeff was talking about - the wars, fears of immigration. It all kind of entwines together. KEYES: If you're tuning in, this is TELL ME MORE, from NPR News. I'm Allison Keyes and we're talking about "Marvels And Monsters" a new exhibition on Asians and Asian-Americans in comic books. Our guests are science-fiction writer William F. Wu. His collection is the primary source of material for the exhibit. And we're also joined by curator Jeff Yang. Jeff, I wanted to ask you, who are some of the current Asian characters in comics? There's an X-Man, or I should say X-Woman, right? YANG: The X-Man you're referring to is Jubilee, of course, jubilee being a Chinese-American, kind of mall-rat girl who discovers her mutant ability to basically shoot fireworks out of her hands. KEYES: Which is pretty cool, you must admit. YANG: Well, it's cool. But it is sort of funny how if you're a superhero of a particular race or color your ethnicity always shapes your power somehow. YANG: So, yes, there are characters like Jubilee. There are characters like Shang Chi, a master of kung fu. Actually a lot of characters who also embody this archetype of the martial artist or the sort of wise occult guru and so forth. Not as many iconic characters on the level of say a Superman or a Batman or a Wonder Woman though. KEYES: William, I wonder if you think Americans still see Asians as Jeff was just saying, exotic people with powers that are based on your ethnicity. You know, people that are magical and able to manipulate your minds. Or has that evolved over the course of, you know, the years you've been collecting and through now? WU: I suppose there is an evolution. I try to be optimistic about these things and I believe there is long-term improvement. But popular culture is extremely important with these matters because by definition it reaches almost everybody. One of the things we often see are kind of the ongoing throwbacks. And I noticed recently in the entertainment news that a screenplay has been turned in for the Marvel character Dr. Strange. But Dr. Strange is a white man who is schooled by the ancient one and he has a young assistant named Wong. You know, it begs the question of what's the white guy doing here? WU: Why not have the Asian guru teach the Asian assistant to become the magician? KEYES: Jeff, I want to ask you in the few minutes we have left. 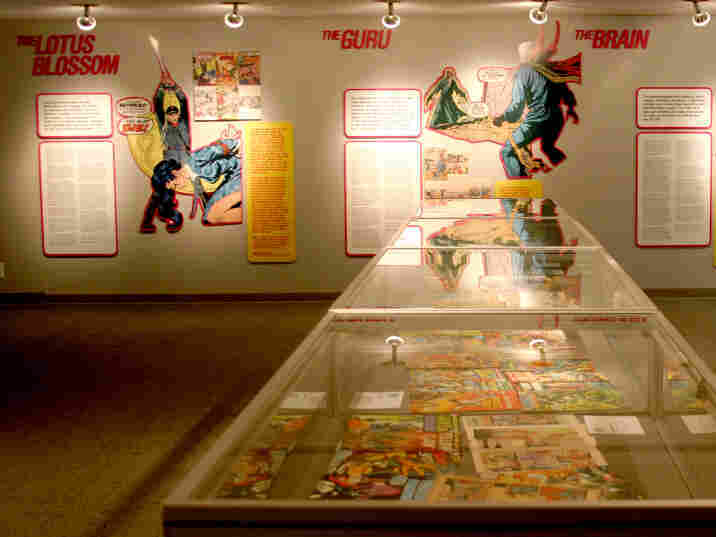 The exhibit ends in the late '80s but that's just before Asian-Americans started flooding the comic book industry. And there's anime out there now. And having just talked about the Dr. Strange movie, how has the characterization of Asians and Asian-Americans changed on the pages of comic books? YANG: I think you've seen a real revolution in the way that Asians are depicted in a general sense, both in terms of inclusion and, generally speaking, cultural sensitivity or authenticity. YANG: Driven more than anything else by the fact that there are so many Asian- American creators. And at this point actually, Asian-Americans at the very highest decision-making levels of the comics industry. Jim Lee for instance is the co-publisher of DC, and as a result, has unprecedented ability to reshape the iconography that all of us have grown up with. I mean as usual because he's a fan he's very respectful to that. But, you know, you're seeing without question new stories been created, new characters that are emerging I think in many ways reflecting a more true sense of what America looks like and the world looks like. KEYES: We've got to leave it there. Jeff Yang is curator for the exhibition "Marvels And Monsters: Unmasking Asian Images in U.S. Comics." He also writes the Asian pop column for the San Francisco Chronicle. He joined us from our bureau in New York. And William F. Wu collected the artwork that's on display. He is also an award-winning science fiction author. He was kind enough to join us from member station KCSN in Northridge, California. Thank you, gentlemen, both. WU: Thank you very much.